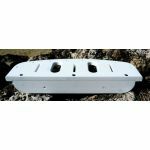 Buck Woodcraft's tackle caddy designs are sized to fit a range of storage and organizing needs. 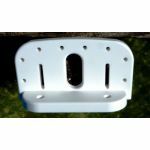 They range in length from 5.5" to 30," and are all designed to mount easily on bulkheads and other vertical surfaces. Our smallest, low-profile tool holder measures just 1" wide & 1/2" high, while our larger units stand 4" high and measure 4.5" front to back. 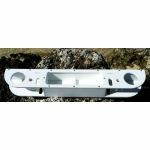 All components are 1/2" thick King Starboard & stainless steel fasteners. Larger units also incorporate small amounts of PVC. 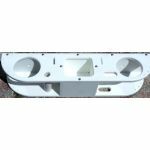 All our tackle caddies are cut on our CNC machine, producing precisely inset, aligned and pre-drilled parts.